The homeowner had remodeled the existing kitchen into a food prep/social gathering space but the new kitchen had little access the adjacent lawn. 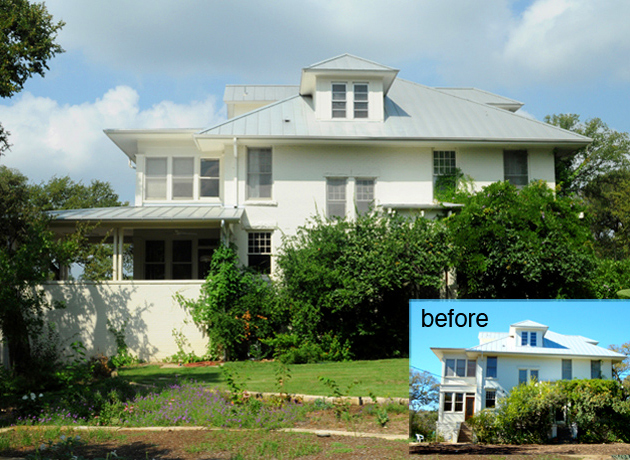 Because the home is a designated Austin Historic Landmark, any changes to the exterior required review and approval by the City Historic Landmark Commission. A master plan for the outdoor entertaining area and house addition was designed, submitted, and approved. Phase One construction included a porch at kitchen level and a stone terrace midway between the deck & the lawn. This multipurpose addition with a broad exterior stair provides audience seating for outdoor movie screenings. Enclosed beneath the roofed deck are rainwater harvest storage tanks. The collected rainwater is used for landscape irrigation and also will be used in a future phase freshwater pool.